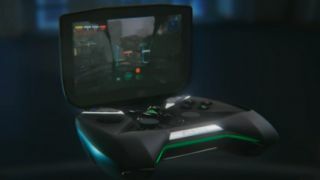 Nvidia's CEO Jen-Hsun Huang has announced a new handheld gaming device during the company's CES 2013 press conference. It looks more like a controller than anything else, although it does boast an integrated 5-inch multitouch screen. The device is "100 per cent Android" according to Huang, and the 4K-capable device is powered by Nvidia's also newly-announced Tegra 4 mobile chip, which boasts 4+1 ARM A15 cores as well as 72 graphics processors. It's the first time the A15 has been used in a quad-core system. "Project Shield was created by Nvidia engineers who love to game and imagined a new way to play," said Jen-Hsun Huang during the press conference here in Las Vegas. "We imagined a device that would do for games what the iPod and Kindle have done for music and books, letting us play in a cool new way. We hope other gamers love Shield as much as we do." When it might come to market remains to be seen. In an age where most handheld gaming is taking place on smartphones, the device may seem a trifle superflous, but at the least it will be a kick in the teeth for Sony and Nintendo. Up until the reveal of Project Shield, Nvidia's very lengthy press conference had rather underwhelmed, with a re-tread (albeit with more detail) of Nvidia's Grid system, as well as the formal announcement of the expected Tegra 4. The company says Shield will be capable of 38 hours of gaming, while there's an audio system that Nvidia says is "on a par" with a Jambox. The company wasn't afraid to make other references either, saying that the display is "retinal". It's a 1,280 x 720 HD, 294 dpi screen. Multiplayer gaming is supported over Wi-Fi. The idea is that you can play cloud-based games from Google Play as well as apps from Nvidia's own TegraZone and even games from Steam - the idea being that Project Shield gives you a different dimension - primarily in terms of portability - for your existing Steam games. We were shown several games in action on a 4K TV including Blood Sword: Sword of Ruin, and there were no pauses or other issues - Tegra 4 is one powerful processor. The new handheld also boasts a micro SD slot as well as an HDMI output and headphone jack. Huang added that the new device could stream media to the television and was the "culmination of five years of work". There's no word yet on the Nvidia Project Shield release date or price. Nvidia also announced at its press conference that Tegra 4 would also offer worldwide 4G LTE voice and data support through an optional chipset, the fifth-generation Nvdia Icera i500 processor. According to the company, Tegra 4 consumes up to 45 percent less power than its predecessor, Tegra 3, in common use cases. And it enables up to 14 hours of HD video playback on phones.